e on one team. The situation became tenuous when the Berlin Wall was constructed in 1962 and western nations began refusing visas to East German athletes. 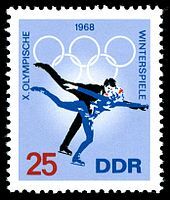 The uneasy compromise of a unified team held until the 1968 Grenoble Games when the IOC officially split the teams and threatened to reject the host-city bids of any country that refused entry visas to East German athletes. Boycott The Winter Games have had only one national team boycott when Taiwan decided not to participate in the 1980 Winter Olympics held in Lake Placid. Prior to the Games the IOC agreed to allow China to compete in the Olympics for the first time since 1952. China was given permission to compete as the "People's Republic of China" (PRC) and to use the PRC flag and anthem. Until 1980 the island of Taiwan had been competing under the name "Republic of China" (ROC) and had been using the ROC flag and anthem. The IOC attempted to have the countries compete together but when this proved to be unacceptable the IOC demanded that Taiwan cease to call itself the "Republic of China". The IOC renamed the island "Chinese Taipei" and demanded that it adopt a different flag and national anthem; stipulations that Taiwan would not agree to. Despite numerous appeals and court hearings the IOC's decision stood. When the Taiwanese athletes arrived at the Olympic village with their Republic of China identification cards they were not admitted. They subsequently left the Olympics in protest, just before the opening ceremonies. Taiwan returned to Olympic competition at the 1984 Winter Games in Sarajevo as Chinese Taipei. The country agreed to compete under a flag bearing the emblem of their National Olympic Committee and to play the anthem of their National Olympic Committee should one of their athletes win a gold medal. The agreement remains in place to this day.